This curriculum is intended to broaden the knowledge of civil society groups and other practitioners about how to incorporate a gender-sensitive approach into the design and implementation of transitional justice programs. 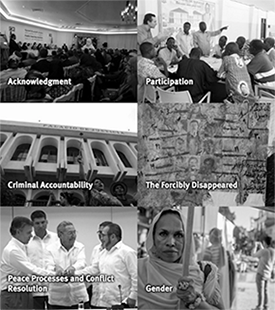 New report aims to help practitioners in the transitional justice field to understand the experience of establishing and operating hybrid courts and to address some common assumptions about these entities. New report from the Save Syrian Schools project examines attacks on schools in Syria and their devastating impact on students, teachers, families, and society. A new report offers insight on how a greater political commitment to inclusion could lead to a sustainable peace in the Central African Republic. Join us for the U.S. Premiere of "The Silence of Others," an award-winning documentary film. This event includes an introduction by Rafael Conde de Saro, Consul General of Spain in New York, and is followed by a special Q&A with filmmakers Almudena Carracedo and Robert Bahar, moderated by Fernando Travesí, Executive Director of ICTJ. Join the Center for Global Affairs and the International Center for Transitional Justice to discuss important initiatives related to certain uses of the veto power by permanent members of the Security Council with Ambassador Christian Wenaweser, Clinical Professor Jennifer Trahan, and our own Deputy Director of the International Center for Transitional Justice, Anna Myriam Roccatello. For this milestone event on February 20, ICTJ and NYU Law School welcomed as speaker former UN Special Rapporteur on the promotion of truth, justice, reparation and guarantees of non-recurrence, Pablo de Greiff. In his address, de Greiff took stock of the transitional justice field, its accomplishments in the past 30 years and the challenges it faces today and in the future. The recorded livestream is now available.